We’ve had a long, cold winter in Connecticut but spring has finally arrived. It’s not warming up overnight, but we can look forward to our trees turning green, our gardens flowering, and more sunshine. That also means we can look to spending more time outdoors. One way to make that outdoor time even better is with great music. Whether you’re entertaining with cocktails on the patio on a balmy evening, having a summer pool party, or just grilling in your outdoor kitchen, the right music adds the perfect touch to the ambiance and mood. Even if you consider yourself an audiophile and think outdoor systems will never sound as good as what you have inside, you might be surprised at the breadth of great audio options for your outdoor spaces. If you already have a whole home audio system in your Greenwich residence, you can take it outdoors and add a new dimension to your home entertainment this season. And if you don’t, you have an excellent opportunity to start from scratch and create a sound system that fills every space in your home with great music. Read on to learn how. You want to listen to your music, but you may not want to see the speakers. You like to hear deep bass with your music, but you don’t want to see subwoofers in every room. The great news is that outdoor speaker systems can be hidden while still blanketing your outdoor space with pristine sound. Sonance is one of our speaker partners and a pioneer in built-in sound. The SonArray system has below ground subwoofers that deliver the low-end punch, with a series of satellite speakers that can be neatly concealed in the landscaping. The beauty of the system is that one set of a subwoofer and satellites can cover a 2000 square foot area, and you can simply add more arrays to include even more. Many people like Sonos for its ease of use, aggregation of a vast array of integrated music services, and its intuitive app-based interface. 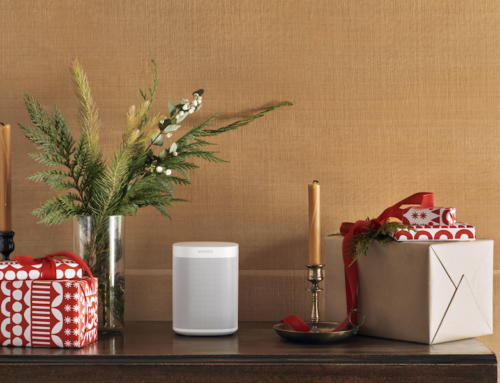 With the recent partnership announced between Sonance and Sonos, these systems work together even more seamlessly. The new Sonos Amp works with any speakers (architectural or otherwise) but the companies have collaborated on a series of speakers called Sonos Architectural by Sonance. The line features weatherproof in-ceiling, in-wall, and wall mounted speakers perfect for the patio area, and they work with Sonos’ TruePlay sound tuning technology to deliver superb sound quality outdoors. The in-wall and in-ceiling models are paintable and have thin grills designed to practically disappear into the surface where they are installed. If you like the voicing of particular speakers you may already own, from highly respected audiophile names like Revel and Bowers and Wilkins, you can get outdoor speakers from them as well and enjoy the same quality outside. Revel’s XC (Extreme Climate) line brings the company’s full, rich, sound signature outside with a variety of speakers to fit various locations. They are designed to withstand anything our Connecticut seasons can bring – rain, wind, snow, and extreme heat and cold. With models that include tall bollards, compact satellites, buried subwoofers, and in-ceiling and in-wall, they cover your outdoor space with sound quality that any audio enthusiast will appreciate. Do you have a boat that you enjoy on Long Island Sound in the summer? Bring the music with you with Bowers and Wilkins Marine 6 and 8 speakers. They are completely waterproof so that you can just hose them off when dirty. With a shallow mounting depth, they can go anywhere, and can also be used in a patio or around a wet area like a pool. Entertainment Technology carries the finest brands in audio, from whole home applications to home theater to two-channel systems. Visit our Mount Kisco showroom and hear for yourself what great audio sounds like. Give us a call or fill out our online contact formto schedule an appointment with one of our audio experts.